The Mainichi Daily News reported yesterday that the DPJ “is set to consider legislation for a permanent law to allow the dispatch of the Self-Defense Forces (SDF) overseas whenever the need arises, as well as to look into authorizing Japan to exercise the right of collective self-defense“. This is important. While the 1992 International Peace Cooperation Law allows for the dispatch of the SDF under UN supervision, this new move seeks to normalise alternative multilateral and joint-US bilateral action such as we’ve seen in the Indian Ocean logistical and Gulf of Aden anti-piracy missions. Such a law would allow a prompt response to international crises, but will no doubt cause worry among Japan’s neighbours. The Defense Ministry’s top civil servant, Senior Vice Minister Kazuya Shinba will head a group to draft a working plan ahead of Kan’s visit to the US during Golden Week, clearly demonstrating the move’s primary audience. Allowing the right to collective self-defence would make Japan a more equal partner within the security alliance, something the Washington has long hoped for. With Hatoyama’s disastrous handling of the US security alliance, this is a big step forward, but with Kan in dire straits, it seems unlikely the DPJ will be able to push anything through by itself. The Mainichi article also suggests that the DPJ seeks to draw the LDP into a grand coalition to fix the deadlock caused by LDP control of the Upper House, although with Kan’s head on the block and Ozawa looking closer than ever to discussing his funding scandal, I doubt the LDP will be eager to hop into bed with them. This all goes to show the DPJ’s stance on defence. They have so far announced that they want to review the three principles governing arms exports, push for a security alliance with South Korea, institute a more dynamic SDF concept, even to reinstate former military rank titles, and now this. 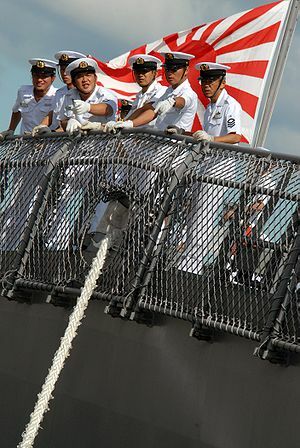 On defence, there is little separating the LDP and DPJ, and with the Senkakus incident putting a wind under their sails, it makes Japan’s advance towards becoming a more ‘normal’ state no longer a question of if, but when.